I was doing some fairly light dirt work today with my 2210. I didn't have any ballast on the rear 'cus it was pretty light work and I had my sub-soiler on. A half full bucket of dirt on a slight left side decline as I backed up with the bucket a waist level. The right rear tire rolled up on a rock and she started to go. I leaned out the right side and punched the forward pedal as I hit the bucket lever to drop it. She came back up promptly but this was a real eye opener! I HATE side hill slopes and always carry the bucket LOW! !..except for this time. Even when it's a slight slope..you may roll over a damned rock and...it's a problem. Also..ALWAYS have rear ballast on...period! Seat belts with rops up! "None with rops down jump in the opposite direction of the roll. Your life is more important than a tractor. I did a similar trick with my old Oliver. I took too big of a scoup of dirt with the FEL. The right front tire was on a soft patch of ground and sunk when I raised the bucket up. I had the left rear up a good 2 feet before I get the laod dumped and the tractor down. Afterward, I kept looking around to make sure the wife didn't see. I don't know if I could have jumped, the pucker factor was holding me in the seat pretty good. I too did almost exactly what you describe the first day I had my 2210. I had a pretty full bucket of topsoil and had the York rake on the back thinking it was enough. Well it wasn't and luckily the tractor landed on the bucket (rear wheel high in the air) and didn't tip over. By lowering the bucket I put the tractor safely back on the ground. The very next day I filled the ballast box full of concrete and now don't even think of using the FEL as anything other than a wheelbarrow without it. About 2 months ago same happened to me with the 4310. Slight decline to left, raised bucket with dirt and I started going over. I thought it was too late - I dropped the bucket and fortunately recovered. I might have had the york rake on - not the backhoe as usual. But I think a lot had to do with raising that bucket up high. I think I forget how much the bucket shifts the center of gravity as it is raised up high when the ground is not perfectly level. Sometime back somebody conceptualized the tipping thing in a way I thought was pretty good. He imagined a 'support plan' and said the tractor is relatively stable as long as the CG remained over plane. The plane was a triangle with the base at the rear wheels at ground level and the apex at the front axle pivot point, which is above ground level and adds stability. Loader weight moves the CG forward toward the narrower part and a hill tilts the triangle off vertical. Some sort of pyramid might be a more complete way of thinking about it, and of course a moving tractor changes thing a lot. However, he was mostly illustrating why a 4wd with a pivot point is more stable than an old tricycle front end. All well and good I suppose but the main object is to gain enough experience to recognize hazardous situations without thinking about them because there's no time for thought when you're in one. I did have one front wheel come off the ground once when a rear wheel when up one hill and the opposite front wheel went up another. Well, I created my own problem by boxing myself in due to poorly considered dumping of spoilings from my backhoe. Then there was the time I was trenching between buildings for electrical. I dug a work pit at one building and started the trench toward the other. I got about halfway and realized I was going to leave a bunch of shovel work when I ran out of room against the other building. So, I dug a pit at the other building and started trenching from that end. I almost connected the trenches when I realized that if I did so then I'd have a trench running underneath the tractor with buildings at both ends--so I didn't do that. Almost another duh. I employed a semi-retired machine operator a few years back, he had spent MANY years on a dozer doing highway construction. He said that way back when they had a very crude 'tilt-meter' on the dozer for doing the embankments and slopes along the road. It was a piece of heavy copper wire in the form of an oval hanging from the canopy, in the center a heavy brass plumb-bob hung from another copper wire. The loop and plumb-bob were a crude switch which sent power to a truck backup alarm over the operators head in the canopy. When the dozer got too close to it's balance point the plumb-bob swung over far enough to touch the loop and set off the alarm. Problem was he claimed it gave the operators so much confidence that they pushed the limits too far. Apparently one operator was killed when he tried to work a hill that was very steep, the alarm didn't go off, so he kept working, except he hit a soft spot and the machine started to slide, when enough dirt built up under the bottom side and the machine started to roll. Bottom line, the 'pucker meter' is probably your best safety device, when it feels uncomfortable, STOP. 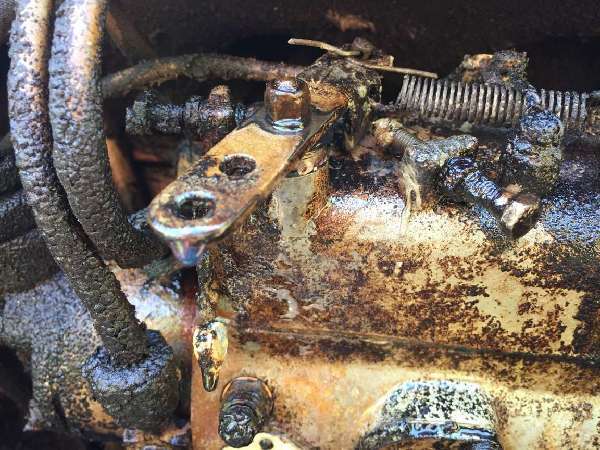 In this story there is a guy who said he developed a engine cut off switch. Whether or not it is a good idea to have no power when in trouble may be debateable but it is a good read anyway.